Writing these house tour posts is a little cathartic for me- even though the house is closed on and not even ours any more, there were just so many hours poured into making that house our home. It is so fun to look through the pictures and to share them with y’all! 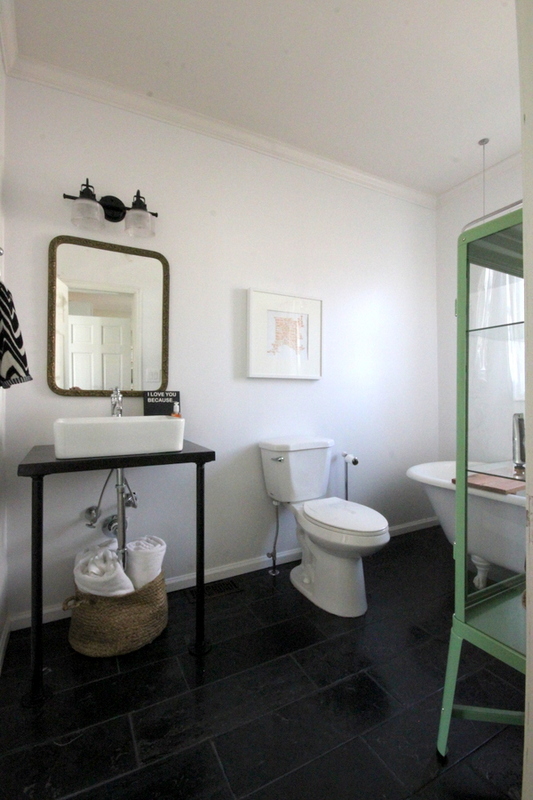 Y’all, I LOVE looking at the transformation of this bathroom. I really (REALLY) hated this bathroom and all it’s orange woods, green granite, movie star lighting glory. 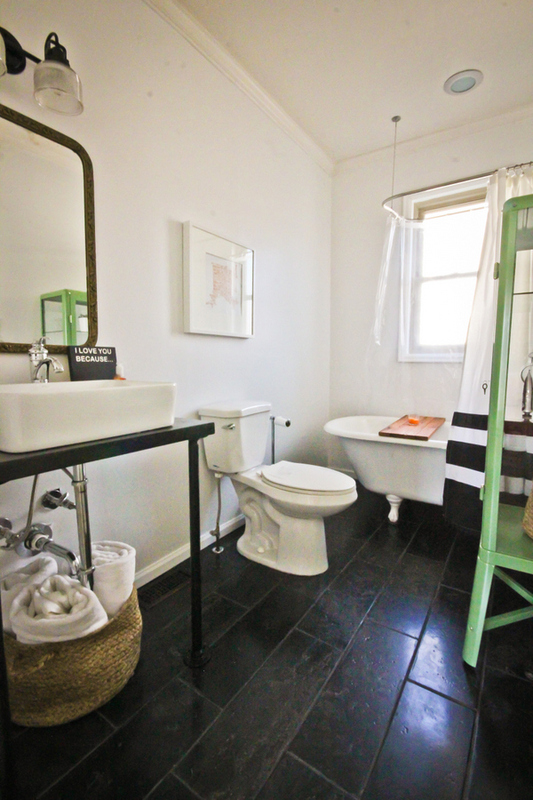 In order to tone things down (and showcase the best part of the room- the clawfoot tub! 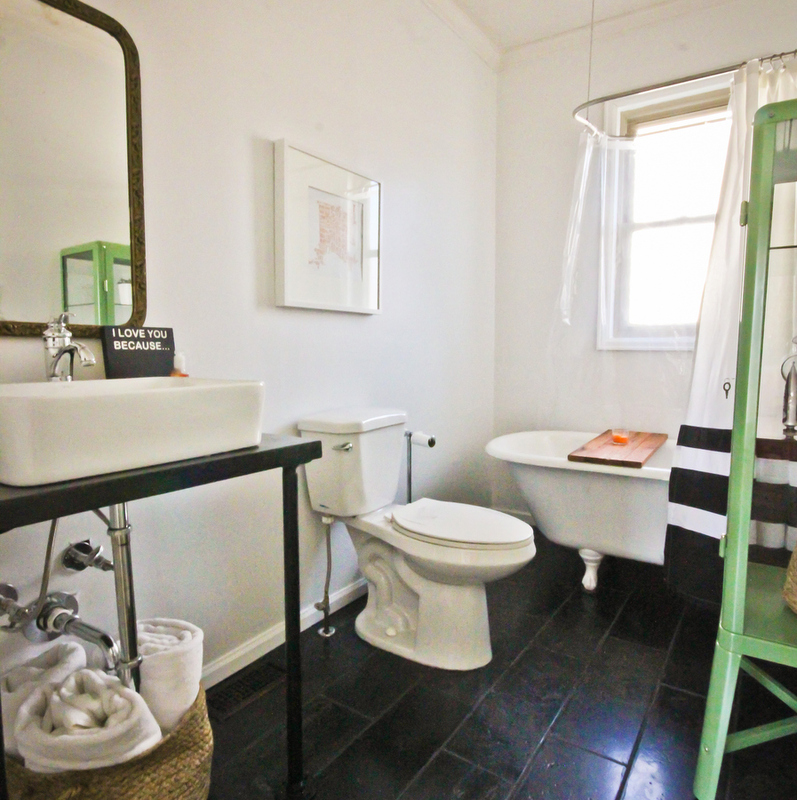 ), we chose a simple black and white classic scheme. 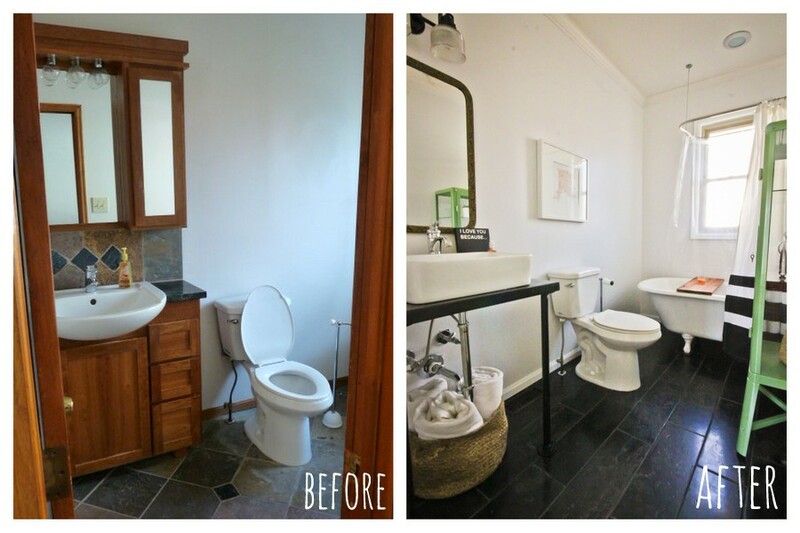 We ripped out the vanity/mirror/lighting and flooring and added black travertine tile on the floor. 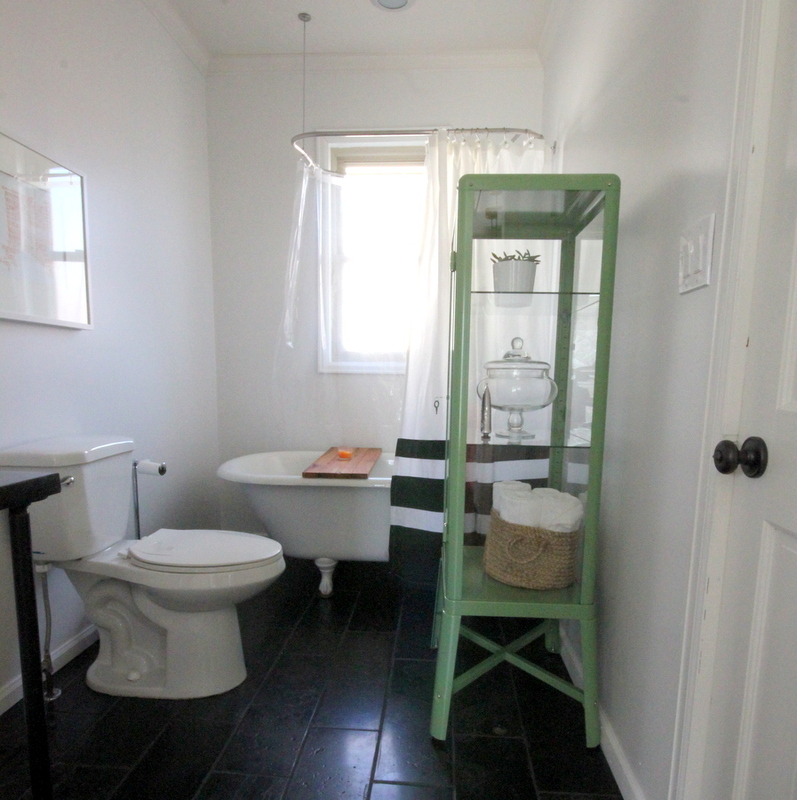 Adam built a simple vanity from galvanized piping (spray painted black) and butcher block (stained black and then layered with several coats of poly for waterproofing) and then added a vessel sink on top. The fabulous vintage mirror is one I found on Craigslist (looking at these pictures makes me wish I’d taken it with us)! The lighting is a basic one we found at Home Depot, also spray painted black. The shelving is from IKEA. Love it almost as much as the mirror. The Denver City Map art is by the ever-so-talented and equally lovely Jenn Goodrich. 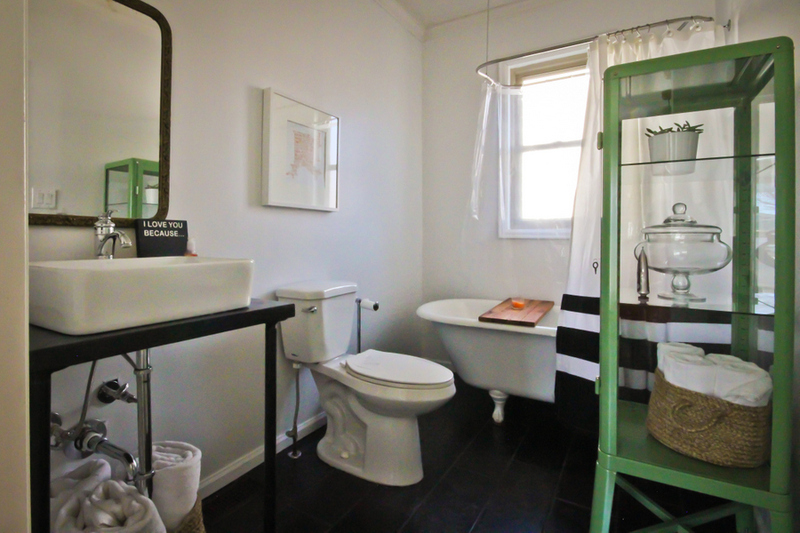 All in all, I am smitten with this bathroom remodel- it was bittersweet to leave this one for sure! This bathroom looks amazing! Great Job. The changes you made makes it look so much larger and open. I should take a few tips from you because I am currently remodeling my bathroom. Thanks for sharing.